Working in various warehouses I always liked a tidy-up, a bit of stocktaking, giving a bit of shape and order to the accumulated muddle and inconvenience of things. Or, at least, the illusion of order and meaning. And even though I always think that the Sunday Supplement and TV reviews of the the year that’s about to end smack of lazy journalism, and easy programming, I realise that this is exactly what I’m heading into. Starting with a poem that’s now over a year old, and which seems like someone else’s. As they do. of being alive while someone else is not. I have been to funerals this year, and learn I am grateful for being alive. There’s been a lot to be grateful for this year, especially things done for the very first time. Like this wordpress poetry cobweb, which has kept me on my toes and anxious and sort-of-productive for about thirty five consecutive Sundays. It has made me reflect, and think and read and research. It has made me read other blogs much more attentively. So thank you Kim Moore and Anthony Wilson and Josephine Corcoran for teaching me so much. It has let me repay debts and keep promises. It let me try my hand at reviewing a poet’s work (thank you, Julia Deakin for putting the notion in my head), and it has made me much more aware of writers who come lateish to writing, as I have. It has let me choose poems by Bob Horne, Liz Venn, Yvie Holder, Andy Blackford, Simon Zonenblick and Tom Cleary. It has let me posture and theorise without interruption (much like being a lecturer again, I suppose). I have used it unashamedly as a platform for my own poems, and no one has told me to stop. Yet. So, thank you, WordPress for letting me make the great fogginzo’s cobweb. Like winning competitions, one of which let me pay for the printing of my first pamphlet: Running out of Space, and one that gave me the prize of being properly published by a proper publisher. So, for Larach, thank you Camden/Lumen, and Sir Andrew Motion, and Adele Ward and WardWood Publishing. And also for my very first book launch. Like submitting poems to various magazines and online sites, and finding out that having more rejections than acceptances is good for you. So thank you to the ones like Magma that are generous in their rejections, and for the care of the ones who take you on board, like Brett Evans at Prole, and the Sansoms at The North, and Martin Malone at The interpreter’s house. Like being the compere at The Puzzle Hall Poets (at the Puzzle Hall Inn in Sowerby Bridge), and being handed a microphone. Which panders to my enjoyment of performing, but more usefully makes me attend closely to all the poets on the open mic. so I can say something that shows their poems have been listened to; it means I have to take notes, and I end up with something like a commonplace book of lines that stood out. I look forward to the first Monday of each month; I enjoy putting the publicity together for Facebook. I really like working with Bob Horne and Freda Davies, deciding who to invite to do guest slots. I like all the friends I’ve made. So thankyou, Puzzle Hall Poets, and thankyou Gaia Holmes for inviting me to guest there in the first place. Which leads me to another first…..being a guest on Gaia’s Phoenix Radio show : Themes for dreamers, which she co-hosts with William Thirsk Gaskell. Last Sunday I got to read my poems and talk about them and choose records to play. I can’t recommend the experience too highly. Like being invited to join an editorial panel for the OWF Press anthology The garden, and having the experience of trying to choose about 65 poems from well over 200 submissions. Humbling, that. But it’s a cracking collection and a worthy follow up to the successful Wheels anthology from the same press. (I’ll put the details at the end of the post). Equally humbling was getting a review accepted by The North…never done one before, and terrified of upsetting four poets who I like. As it happens I didn’t. But I’d no idea how stressful it was going to be. Much rather let someone review mine. What else? Last but not least, a poem-week-year has finally come to an end. This was the idea of Andy Blackford, whose poems appeared in the cobweb earlier this year. We’d met again after a gap of of about 40 years; Andy reckoned that since Bunuel and an artist friend used to meet to exchange and critique a piece of art on a given day each week, there was no reason why we shouldn’t. And there wasn’t. We now have to decide what to do about the 104 poems we’ve written. Got a title. Gap year. So, you might well ask, after all that…………….. the silence and the stupidity and the funerals? What’s all that about? And Paula Rego? Come on! rocked in the emptying stoup of my womb. to stitch me back in. Just listen to this, and its precision of sound, the consonantal snag of that ‘stitch’. Do you see why I might think again of Paula Rego….maybe one image in particular? There’s that physicality, that sensuality, again, and again infused by the unspeakable loss of a child that has to be spoken and spoken for. That controlled intensity that has the lines shivering with energy. Just one more now. Kim Moore, this time,one who has dealt with abusive assault, or has come to deal with it. ‘If we could speak like wolves’. And there’s that energy again, that physicality that’s nailed in two words: stubble sharpen. And so it starts with The Sunday Poem. Or at least, that’s a catalyst. I read these poems, and then I read what I’ve written in the last two years and I see what isn’t there, and I wonder if I have access to what’s missing. Just to explain why I chose that opening quotation from George Eliot; for the last 18 months or so I have grown gradually more deaf. It’s something that can be dealt with, and will be, but at the moment I hear the world through a soft sieve. I miss the point of conversations and questions if I’m not attending. It’s like listening to French. I recognise songs on the radio by the bass lines and drum patterns but I can’t hear the whole tune. And now these poets. It’s as though they’ve shown me emotional registers and harmonies that I can’t hear or feel for myself, as though, in George Eliot’s word I’m ‘well-wadded’. 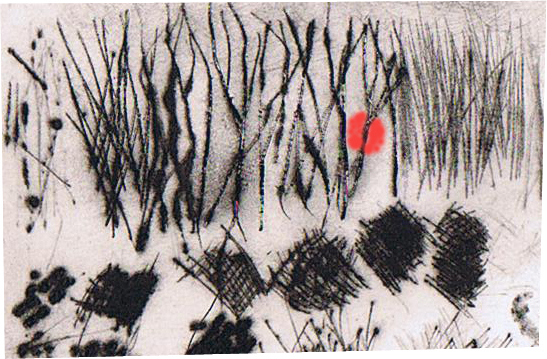 I’m writing rhetoric and well-observed landscapes, and anecdotes, but I’m not accessing the whole picture. It won’t be forced, but it must be possible. I wonder how. I think that next week I might go on thinking about this, and about learning a new language, or a bigger one. So there we are. One year finishing, and whole new bunch of stuff to be fighting through. Hope your coming year will be exciting and happy in equal measure. Out of a goodly number of great posts, this is the pick of the crop. Stunning. And you know, sure as eggs is eggs (because you understand how stories work) that something is going to change. And you also know that for all of the lights of the tree and the warm of christmas fires that there’s a darkness out there somewhere, and that nothing will be simple. Hoban does that. He does it with ‘The Marzipan Pig’, which is one of the oddest stories (ostensibly) for children I know. It begins, ‘there was nothing to be done for the Marzipan Pig. He fell behind the sofa and that was that’…..three pages into the tale he is eaten by a mouse, which, in turn is eaten by an owl who falls in love with a parking meter. It’s near impossible to second-guess what’s going on, and yet it’s never silly or arbitrary. I love Russell Hoban, not least for his unwavering acknowledgement of a Darwinian universe that’s red in tooth and claw, and his equally unwavering belief, in these two stories, and in the wonderful ‘Riddley Walker, of the resilience of the human spirit and the power of love and faith and idealism. I also love the fact that when I met him at a Children’s Literature conference in Exeter in the 70’s, we shared a breakfast table. He ate All Bran. At the same time, he handrolled cigarettes. Old Holborn is almost identical to All Bran, at least when they accidentally mix. He would get animated about the teachers on his workshop who wanted breaks…for chrissakes…breaks….they come here to write….it’s hard work, writing…breaks!….and he scattered more strands of Old Holborn about the table. It was a great start to anyone’s day. The Mouse and his Child are wind-up clockwork toys, broken by a cat, thrown in the bin, mended -sort of – by a tramp, and set down on the highway to seek whatever befalls them – which comes in the shape of Manny Rat – and recruited into a hapless band of wind-up bank-robbers. 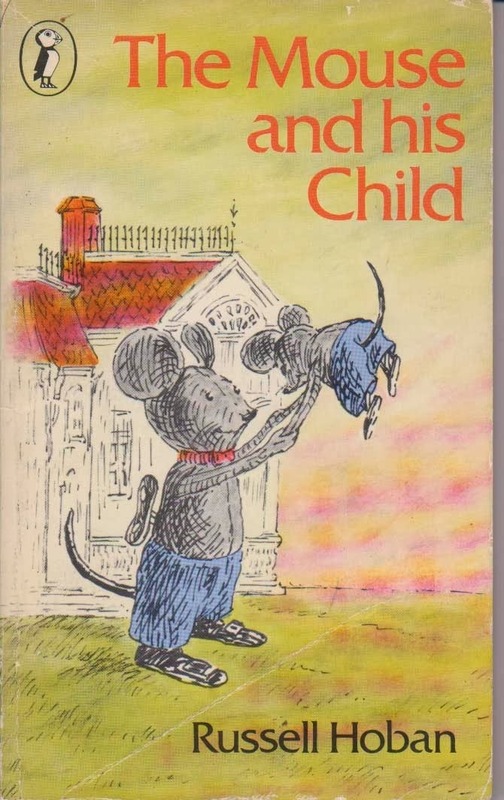 I’ll tell you no more, other than that, along the way, the Child determines on an unwavering quest for self-winding status and for a family, and that Manny Rat becomes his nemesis. They pass through wildernesses; they endure. It’s like the journey of a Scott, or a Shackleton. There are episodes I was reminded of when I read Joe Simpson’s epic ‘Touching the void’. Maybe I’ll say too that in the summer when my dad died, we took my mother away for a holiday. I was reading ‘The Mouse and his Child’ on the beach on the Isle of Wight. When I came back from a swim, my mum was reading it. She would not hand it back till the next day when she’d finished it. All she said was: that made me happy. I have to say I’m a total sucker for soft toys and dolls. 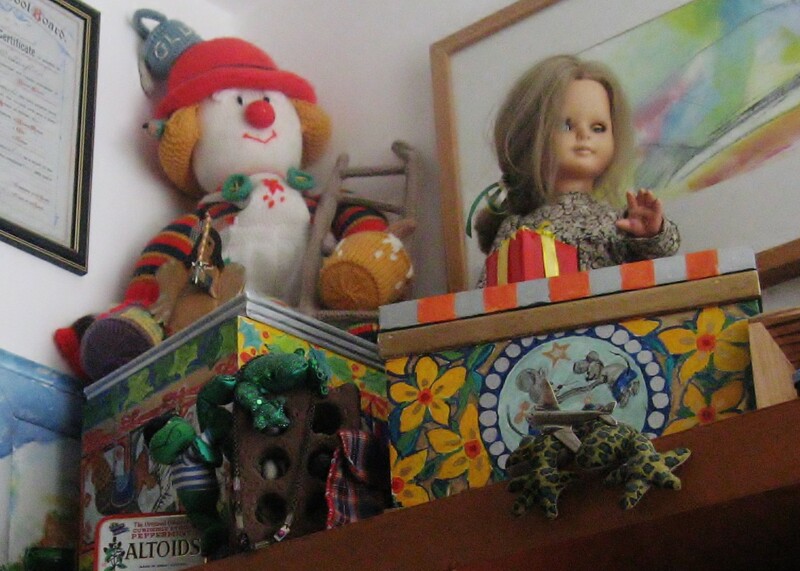 Especially dolls like the one my daughter Julie had as a child, the one she gave me, the one who always looks so wistful that I provide her with the company of a dapper fox and and a perky decorator. She remains wistful, does that doll. And, also, since 1987 me and my partner Flo have bought each other wind-up toys at Christmas. They now fill two boxes. None have become self-winding, and I have never heard any of them speak. The Mouse and his Child, of course, can speak, and indeed are not bound by the rules of clockwork and the strokes of midnight. I wasn’t really aware, though, how much of the language of the book had seeped into mine until, inevitably there was a writing task at the Poetry Business, and out of ‘nowhere’ came this poem. or trees, or owls can speak. or week. This is the truth of it. bit by bit, grows coarse and gritty. have forgotten how, and what, to say. Stay silent till the twelfth night. And then they’re put away. To be honest, ours have their own very jolly boxes, which never go into the dark. 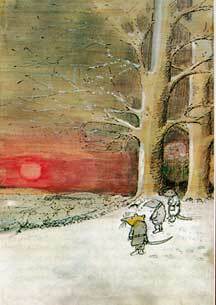 And if ‘The Mouse and his Child’ had been as dark as my poem, then my Mum wouldn’t have been happy. Have your own Happy Christmas, and light a candle for clockwork wind-ups wherever they may be.